Many have read Nan Stein and Bruce Taylor’s recent commentary article in Education Week Stop Pretending Sexual Assault Can’t Happen in Your School. The authors are well known for their work developing and evaluating the evidence-based sexual violence prevention program Shifting Boundaries. In their recent article, Nan Stein and Bruce Taylor highlight how and why sexual violence is underreported, especially for adolescent sexual violence. We’ve come a long way in the recent decades in measuring teen sexual violence; we had no Centers for Disease Control and Prevention (CDC) data on sexual violence prior to 1999, and now we estimate that 10% of high school students were sexually assaulted in 2017, according to the CDC’s Youth Risk Behavior Survey. Coming to the realization that 1 in 10 high school students are sexually assaulted in a year can be difficult, and to some, it seems unimaginable. We know that sexual violence is preventable, and prevention can happen at any age and any location. Nan Stein and Bruce Taylor provide three action steps schools can take to create safer environments for their students. 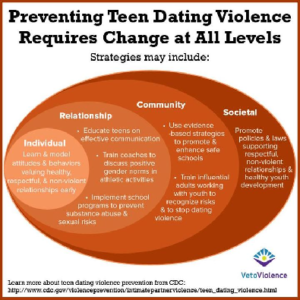 These steps are: (1) Use evidence-based interventions; (2) Go beyond the classroom and use prevention strategies that have a school-wide reach; (3) Train staff to understand and prevent sexual harassment and violence. To read the article in full, click here. For more evidence-based sexual violence prevention strategies, review the CDC’s STOP SV: A Technical Package to Prevent Sexual Violence, and visit the CDC’s Sexual Violence: Prevention Strategies website. Join us on our next web conference to learn more about preventing teen dating violence and sexual harassment in schools.